Here are some experiences that many parents can relate to: Your child comes to you with his math homework completed, and, barely looking up from the dinner you are preparing or the school forms you are signing, you halfheartedly say “that’s great honey”. Or maybe, after the sixth try, your child has finally tied her sneakers, but since she is at an age where she should know how to do this and you are now late for school, you quickly run out the door as soon as she is finished with a quick, “come one, we’re going to be late!” Although every parent has moments where they may feel too rushed or busy or preoccupied to take the time to give effective praise, these past missed opportunities can become future occasions for giving your child labeled praise. And in the long run, this will lead to a child who puts more effort into his homework and who ties her shoes every morning. Proximity. Be close to your child when you are giving praise, rather than yelling it from across the room. Your child is more likely to pay attention if you are standing near him. Be enthusiastic and sincere in your praise. It is important for children to see that as much energy as you put into them when they have done something wrong, you are even MORE excited and energetic when they do something well. 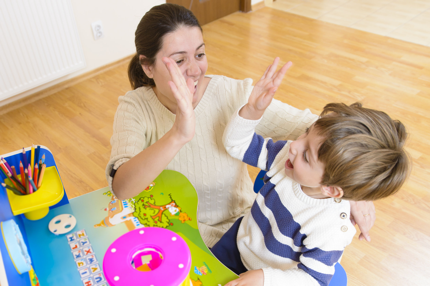 Use non-verbal reinforcers such as a high five, a hug or a pat on the back. This makes your verbal statements more powerful since they are coupled with another positive reinforce. Be specific about what the child has done that you are praising. This is vital because it is by being specific about what the child has done well that he can learn what to do in the future. In addition, telling your child “I really appreciate how you came inside right when I asked you to” is more meaningful and shows more effort on your part than “good job”. Keep the praise developmentally appropriate. Keep the language, tone of voice and content of praise appropriate to your child’s level of development. For example, whereas a higher pitched, more sing-song voice is great for younger children, it can seem patronizing for older children. But why is this important? What are the effects of doing labeled praise rather than just the more generic “great job”? Your child will feel better, both about you (the parent) and about himself because you are being more positive and he is learning that he is doing good things. An increase in the behaviors for which your child is receiving labeled praise. This can also lead to a decrease in negative behaviors because there are only so many hours in a day and if your child is spending more of their time engaging in positive behaviors, they will automatically have less time for negative behaviors! Increased positive feelings towards your child as you are putting more effort into thinking about what they are doing well. Giving praise appropriately to children can be an important element in strengthening your relationship with your child and helping them to feel good about themselves as well.